As a researcher in residence at the Ahmed Iqbal Ullah Race Relations Resource Centre I worked with the Tandana Collection, which was produced by Anandi Ramamurthy during the research into her 2013 book Black Star: Britain’s Asian Youth Movements. It contains material from members of AYMs in Bradford and Sheffield. Radical political activism can be explored through archival research. It provides insights into the actions of individuals and organisations. Communicating these insights to contemporary audiences requires the researcher to explain the social and political context in which activism emerged, flourished and disappeared. My perspectives on activism in black politics in general and the AYM in particular have changed over time. They have adapted to fit the stories I tell about myself. Reflecting on how my views have changed has been an important part of the research process. Members of the AYM in Manchester came from diverse backgrounds; there were men and women, young people from India, Pakistan, Bangladesh and Britain. Many of us regarded ourselves as British and had relationships that crossed religious, racial and cultural boundaries. Our campaigning work focussed on anti-deportation campaigns. Racist immigration laws were designed to stop the perceived influx of Black people. At that time children born in Britain had a right to stay here. Many of the cases were about the deportation of one parent who had lost their right to stay in Britain. Relationship breakdown, domestic violence or a failure to comply with bureaucratic procedures all threatened to divide families. We built support in local communities, involved the trade union and socialist movement, and reciprocated individually and collectively in support of worker’s struggles. Our analysis and discussions sought to ground activity in understandings of race, class and gender relations. I did not appreciate the extent to which other members of the AYMs I worked with weren’t grounded in a similar worldview to ours. I failed to deal with the misogynistic views and behaviours of some AYM members. An AYM delegation visited Sinn Fein in West Belfast, and some members demonstrably lacked empathy with the experiences and vulnerability of people living under British occupation. Looking at the archive material reinforces these recollections and brings back memories of how uncritically we accepted the credentials of others to speak on our behalf. Some members were working in the developing ‘multicultural’ industry. Like many black activists and organisations of the time we struggled to resolve the contradiction of acting as agents of racialised state systems of control, whilst organising resistance to it. This was a contradiction which ultimately led to the demise of the AYM in Manchester. The research process has provoked a personal interest in exploring recollections of other activists from the time, particularly those who retreated from radical perspectives. In particular I still find it difficult to understand how some of my colleagues returned to family cultural norms, arranged marriages and religious practices. The same could be said of those Catholics I grew up with who returned to the church once they had settled down and had children. Anger at social injustice still motivates me though I am less confident about being part of organisational ways of acting against it. The knowledge gained from working with the archive provides an opportunity to connect the struggles represented then to current issues. Black people today still face racist and fascist violence, state discrimination from the police, schools, housing and immigration authorities, and discrimination in the labour market. 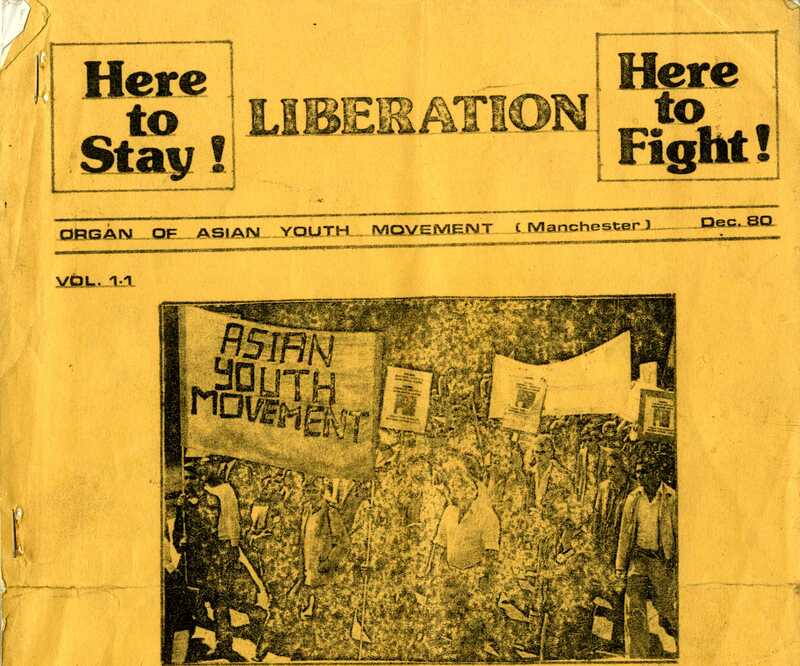 This entry was posted in Opening the archive, Thinking about collections and tagged activism, asian youth movements, Manchester, personal history, research, researcher in residence, tandana collection by aiucentre. Bookmark the permalink.